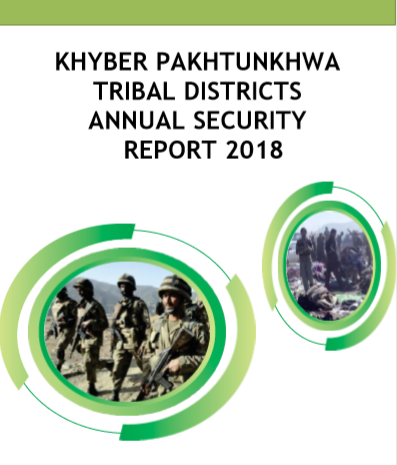 ISLAMABAD January 15, 2019: The security situation has slightly improved in the Khyber Pakhtunkhwa Tribal Districts (KPTDs) during the year 2018. A total of 264 violent incidents (127 terrorism and 137 counter-terrorism) incidents were recorded during the year 2018 compared to 325 (153 terrorism and 172 counter terrorism incidents in 2017. This shows a decrease of 17 percent in terrorism incidents while 20 percent in counter terrorism incidents in 2018 as compared to the previous year. Of the total 127 terrorist incidents in 2018, 63 terrorist attacks (50 percent) targeted the security forces while 58 attacks (45 percent) were directed against civilians. Five terrorist attacks (Four percent) targeted members of civil militia or Amn Lashkar. One incident of infighting between terrorist groups was also report during the year 2018. The violent incidents of both terrorist and counter-terrorist, resulted in a total of 366 casualties – 152 killed and 214 injured – in all the KP Tribal districts, marking a significant decrease of 70 percent in overall casualties. Of the total casualties, 192 (75 Killed and 117 Injured) were that of civilians, accounting for 52 percent of the overall casualties. 136 casualties (75 killed and 92 injured) were borne by the security forces which make it 37 percent of the overall casualties while eight casualties of Amn Lashkar personnel (five killed and three injured) were also reported during the year 2018.